With the promotion of Anthony Rizzo this past weekend, it looks like San Diego general manager Jed Hoyer is willing to give his team another shot at the pennant race before conducting a fire sale. Along with the attempt to increase run support, the Padres are also counting on continued success of its starting rotation. One of them is the Padres’ Opening Day starter, Tim Stauffer, who has never been on a starting rotation for an entire season. Despite his inexperience, Stauffer has excelled in his role, and seems to grow more accustomed to it with every additional start. Stauffer was drafted number four overall in the 2003 MLB Draft after being a two-year starter for the University of Richmond Spiders. Going into the draft, and coming out of college baseball, Stauffer was considered as one of those college pitchers who could be credited for his work ethic, “polished” stuff and excellent control. If anything, Stauffer was considered a low risk pick, as many scouts believed it would not be long before he reached the majors (some projected even as early as a year). The low risk mark was shattered however, as Stauffer told the Padres after the draft of a possible shoulder injury sustained in his last start, during the NCAA regionals. Although “shoulder weakness” was the prognosis, Stauffer took less money than the number four draft slot would have gotten had he not told the franchise. It was a bold move, but the Padres were impressed with his sincere character, and thus appeared happy with their selection despite the injury woes. In 2004 (statistics are listed above at each minor league level), Stauffer split time at three minor league levels, climbing up the organizational ladder—as many scouts had projected. It didn’t seem like a long shot that Stauffer would indeed join the San Diego beach bums in 2005. 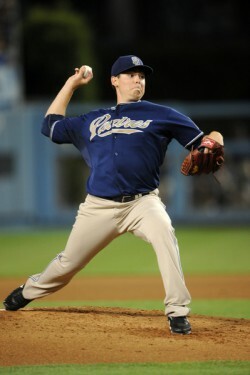 As it so happened, Stauffer joined the Padres’ starting rotation for the 2005 season on May 9, 2005. Through 14 starts (pitching 81.0 innings), Stauffer proved to be pretty average; occasionally pitching gems, but for the most part giving up at least a few runs in five to six innings of work. He also compiled a 49/29 K/BB rate, giving up 10 home runs during his stint with the major league club. Stauffer was subsequently sent down back to Triple-A Portland in August. The next two seasons he continued to rack up innings in the Padres’ minor league system, with a couple of spot starts here and there. Unfortunately, Tim missed the entire 2008 season due to his first major injury; he needed surgery on his shoulder (the earlier miscues with his shoulder coming to fruition, five years later). Stauffer spent the first half of the 2009 season rehabbing in the minor leagues. Once his opportunity to start came up, he had similar peripheral numbers to 2005, but mixed with much better success in leaving runners on base (67 percent in 2005 compared to 80 percent in 2009); his xFIP was similar from the two years as well. Same pitcher, different outcome. Stauffer was unable to secure a starting rotation spot in 2010, but pitched pretty well in long relief for the Padres—until he suffered a mid-May appendicitis. He returned in mid-September and started six games during the very stressful NL West pennant race that came down to the last game of the season (the Padres lost to the Giants). Stauffer is generally considered to have four good pitches as a starter. In 2010, he mainly used his fastball and slider during relief appearances, but has also turned to his change-up and curveball during his starts in 2011. 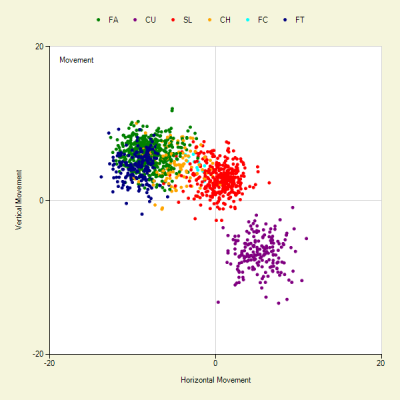 Below is a graphic (thanks to Fangraphs) of his 2011 pitches, graphed by horizontal movement against vertical movement. *On his Fangraphs page, his slider has been credited as a cutter this year by BIS, but it is more than likely the same pitch. So far this year, Stauffer has had a 2.27 GB/FB rate. His 22.5 percent line drive rate is pretty high, but looks to be mitigated by his 11.7 percent infield fly ball rate. His home run-flyball rate has also been pretty close to the league average at 8.3 percent. His opponent batting average on balls in play is also around league average at .319. Not only is he getting plus results, his peripherals suggest his success isn’t at all bloated as his xFIP is at 3.15. From reviewing Stauffer’s career, we can see that his journey toward a set role on a team took longer than anticipated. Adjusting to the majors while also being sidelined by long term injuries seems to be the main hurdles in Stauffer’s career (but then again, many players deal with these factors). Given the opportunity to be a full time starter, Stauffer has shown he is offering almost exactly what scouts saw in him during his days with the Richmond Spiders. The scouting projections in 2003 seem to be earning more credit, though the timing was a bit off. Even so, he is still only 29, and is likely to be very much useful to the Padres in the coming years (according to Baseball Reference, he is an eligible free agent in 2014). With the Padres trying to catch the Giants this year they will lean on their own version of a “Timmy”: four inches taller with 30 extra pounds on him. Most statistics come from Fangraphs (this article has statistics from Stauffer’s 2011 season as of his June 12 start against Washington). Baseball Reference was used, as well as news articles regarding Stauffer’s journey through the minors.